Welcome to Staybridge Suites in Lovely Downtown Lubbock, Texas Conveniently situated across from Texas Tech University, Staybridge Suites Lubbock is near the University Medical Center, Covenant Health Systems and the Lubbock International Airport. 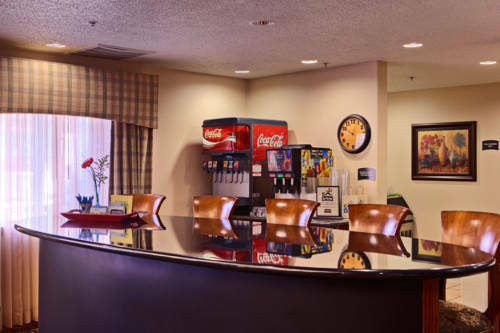 This upscale extended stay Lubbock hotel offers easy access to a number of exciting attractions and well-known businesses. Ideally located in downtown Lubbock, TX, our pet friendly lodgings are near the famous Buddy Holly Center and the thrilling Joyland Amusement Park. Live music performances in the Depot Entertainment District and Texas Tech sporting events can also be found less than two miles away. Business travelers appreciate our extended stay Lubbock accommodations near companies such as Wells Fargo, Bank of America and Merrill Lynch. In order to meet our guests' business needs, free high-speed Internet access and a 24-hour business center are conveniently available on-site. During your stay, we hope you will feel right at home in one of our spacious suites featuring full-service kitchens. Complimentary breakfast, guest laundry services and evening Social Receptions are provided for your convenience, while an outdoor pool and whirlpool, a fitness center, a guest library and a barbecue grilling pavilion are available for recreation. As you plan your trip, we invite you to explore our exceptional Lubbock hotel rates and make your reservations today. IHOP: Enjoy breakfast, lunch or dinner anytime of the day. IHOP is conveniently located across the street, within walking distance of the Staybridge Suites. Childrens's program - Joyland Amusement Park is 5 minutes away from the Staybridge Suites Hotel. The Rawls Golf CourseTexas Tech University Golf Course located at 4th Street and Memphis Ave.